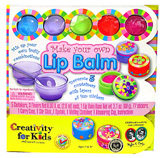 CRAFT KITS and ACTIVITY SETS Provide Fun Ways for Kids to Express Themselves While Learning Creative and Motor Skills. Kits will give kids hours and hours of fun. Dig Discover Display Crystal Mine Educational Kit is an exciting way to learn. Mix up your own fruity combinations and place them in containers you decorate! to assemble without tools or glue.